Lakeside Nature Center is located in Swope Park at at 4701 East Gregory Boulevard. The Center is open Tuesday through Sunday, from 9am to 4pm. Lakeside is not open to the public on Mondays. Nearly 50,000 visitors annually walk through the Center to enjoy native wildlife in natural exhibits, accompanied by informative, innovative graphics. Several aquariums, including one that is 600 gallons, feature Alligator Snapping Turtle, other aquatic turtles, tiger salamanders and native fish. See native venomous snakes like Timber Rattlesnake and Copperhead. Constrictors like the Black Rat Snake. Bullsnake, Milk Snake, and Prairie Kingsnake are just a few of the reptiles that our visitors can admire. 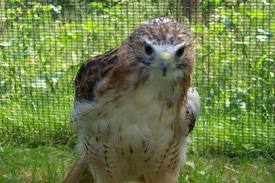 This Red-Tailed Hawk was found in the wild in a weakened condition. It appeared that the bird was socialized with humans, suggesting that someone had raised it. It could not learn to hunt on its own, so became a permanent resident at Lakeside Nature Center. Other birds of prey at Lakeside include a Barn Owl, Barred Owl, Mississippi Kite, Broad-winged Hawk, Turkey Vultures, Red-Tailed Hawk, Peregrine Falcon, American Kestrels, and Screech Owls. These birds are on display and are used during our wildlife programs. Check them out here. Click here to see a printable checklist of birds found in Swope Park. Behind Lakeside Nature Center is a graveled walking trail that runs roughly 1/3 mile. The trail is atop a limestone ridge that overlooks a valley below. Along the trail, signs provide information about the different areas. See a beautiful water garden, watch butterflies and hummingbirds visit the prairie flowers, see bluebirds catch insects in the savanna, enjoy the shade of the oak and hickory trees, and walk along the awesome Bethany Falls Limestone boulders. Nestled in the valley behind the Center, the trail meanders along limestone bluffs, beside the scenic Fox Hollow Creek, through old riparian forest, all the while exploring the colorful personality of a deep, primitive, wetland valley. Behind the original Lakeside Nature Center at 5600 Gregory, a trail meanders around a marsh and to a bend in the Blue River. The trail is accessible except after heavy rains. The marsh acts as a sponge to hold the rain water and slowly allow it to run into the Blue River. Kingfisher, herons, toads, frogs, turtles, snakes, and various other birds, mammals, reptiles and invertebrates make this unique habitat their home. Call (816) 513-8960 for information and prices or e-mail us. 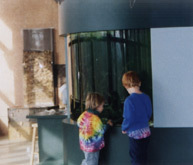 The classroom at the Nature Center is available to rent for one to two hours during the day on Saturdays during regular open hours. It is often used for children’s birthday parties. Prior to or following the party, the Naturalists can be scheduled to present a wildlife program for the group. A rustic dining hall with full kitchen is located at nearby Camp Lake of the Woods. Facility is a great place for a family reunion, wedding reception or corporate retreat. Dining hall will seat about 100 people. The Hogan has been used by Scout groups for many years. The octagon shaped building is a great indoor retreat and the surrounding grounds are perfect for tent pitching. The nearby fire ring and glade trail make it the perfect setting for an overnight.